Christian Hebraist; born at Alt-Randen, in Silesia, July 15, 1631. After having completed his studies in the universities of Wittenberg and Leipsic, he traveled through Holland, France, and England. 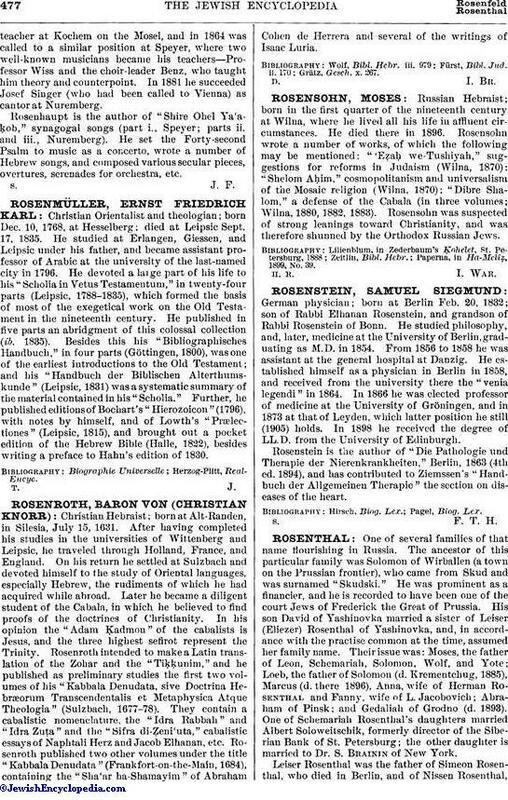 On his return he settled at Sulzbach and devoted himself to the study of Oriental languages, especially Hebrew, the rudiments of which he had acquired while abroad. Later he became a diligent student of the Cabala, in which he believed to find proofs of the doctrines of Christianity. In his opinion the "Adam Ḳadmon" of the cabalists is Jesus, and the three highest sefirot represent the Trinity. Rosenroth intended to make a Latin translation of the Zohar and the "Tiḳḳunim," and he published as preliminary studies the first two volumes of his "Kabbala Denudata, sive Doctrina Hebræorum Transcendentalis et Metaphysica Atque Theologia" (Sulzbach, 1677-78). They contain a cabalistic nomenclature, the "Idra Rabbah" and "Idra Zuṭa" and the "Sifra di-Ẓeni'uta," cabalistic essays of Naphtali Herz and Jacob Elhanan, etc. Rosenroth published two other volumes under the title "Kabbala Denudata" (Frankfort-on-the-Main, 1684), containing the "Sha'ar ha-Shamayim" of Abraham Cohen de Herrera and several of the writings of Isaac Luria.